This book will not only make children want to garden, it will make them want a dog and a bird, too. The Biscuit books are spectacularly good at getting children to read, but, surprisingly, they also teach grown-ups how to read them. They’re missing the usual cues that help adults make sense of a text. For example, there are no quotation marks. This makes passages of dialogue very accessible to beginning readers but a puzzle to their parents. In some scenes, most of the dialogue is either “Woof, woof!” or “Tweet! Tweet!” Readers can imagine that the book is teaching them to talk to animals. There are children’s books that are classics because they speak equally to children and adults. This book is not one of them. 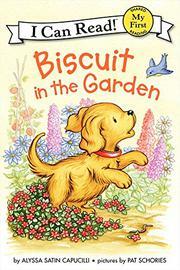 The plot is slight: Biscuit spills birdseed in the garden. Birds flock happily around him. But no matter what the parents think, children will want to read it again and again, and that makes it a classic for them. LET’S SAY HI TO FRIENDS WHO FLY!